I was invited to participate in a two-day expert workshop hosted by West Virginia University's Department of Geology & Geography. 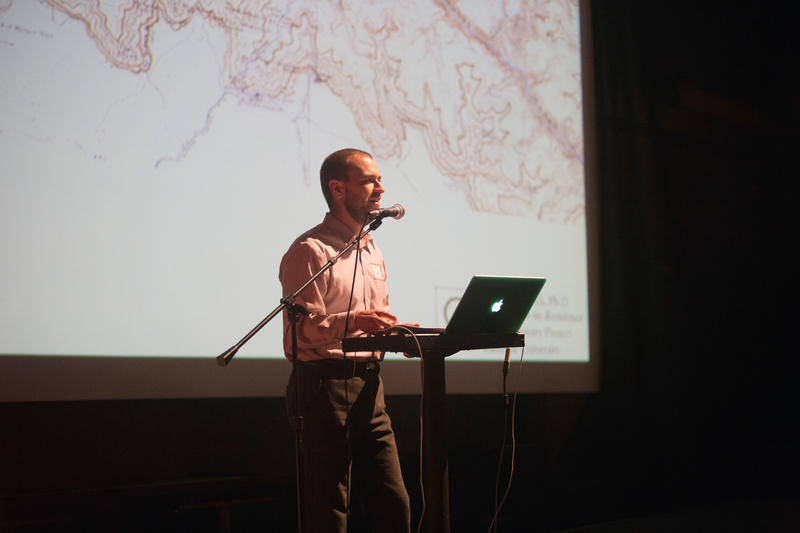 The title of the event was “Methods for Deep Mapping and Spatial Story Telling,” initiated by geographer Trevor Harris. Our primary goal was to specify as much as possible how one can go about producing a "deep map." One definition of a deep map is an object that augments the imagination. One question I left with was why exactly do we need a graphic form (a map) to be intimate with what others experience? Professor Harris took the group on a tour of the WVU "Cave," an immersive digital environment in which virtual realities can be constructed and experienced with the aid of four screen walls and 3-D glasses. 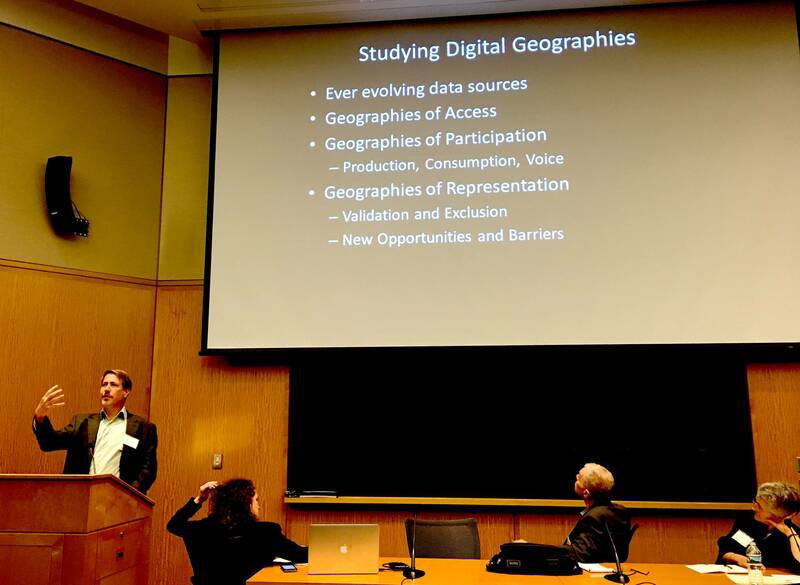 I had the opportunity to attend and present at the Center for Geogrpahic Analysis at Harvard for the conference "Space, Place, and Geographic Thinking in the Humanities." The conference program is available here. My talk was titled "Design and Digital Publishing: Representing theoretical advances in the Geohumanities." It was rewarding to introduce my digital scholarship to such a distinguished group of friends and colleagues. Video of the conference will be made available soon. 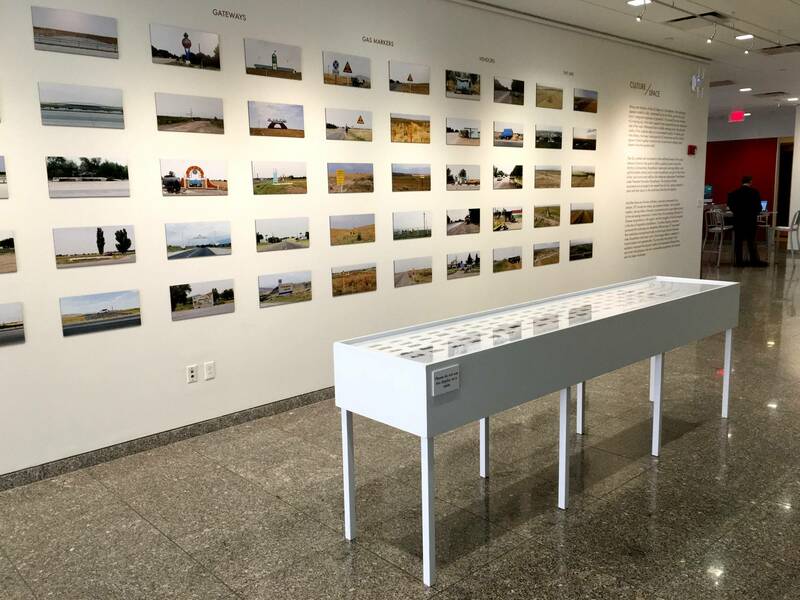 By happenstance, in our conference building the exhibit "Crossing Kazakhstan: The Monumentality of Linear Landscape" was on display, which included a beautiful standing table legend for the series of photographs that accompanied the very "space forward" exhibit (see above). Or you can see a video of the project here. 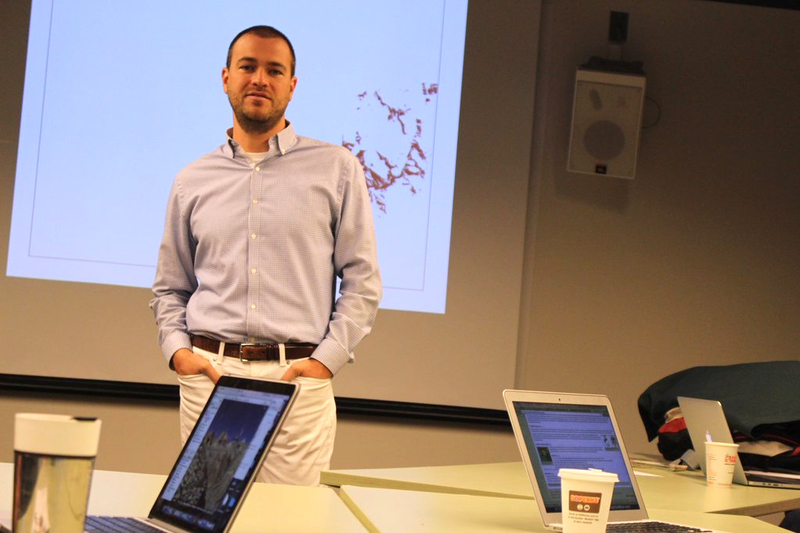 Below is a picture of Matthew Zook presenting, professor of geography at the University of Kentucky, and co-founder of New Maps Plus. In February I traveled to Emory University in Atlanta to do a series of talks and workshops with their very forward-thinking Digital Humanities groups. 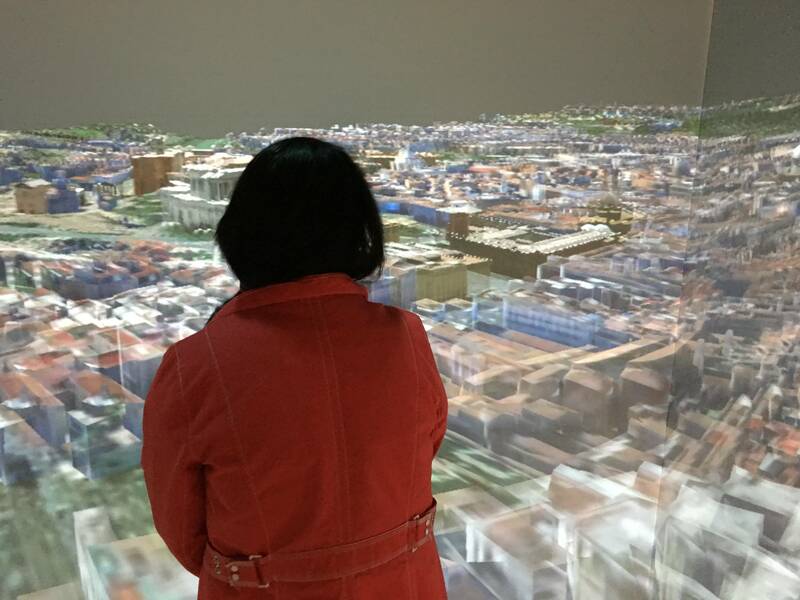 The main lecture was part of the Digital Mapping and the Humanities Lecture Series, organized by assistant professor of art history Susan Gagliardi. Susan's project "Mapping Senufo" is a great application of DH techniques to art history. While on campus, I also had the opportunity to present at Emory's Fox Center for Humanistic Inquiry Digital Publishing Roundtable. There I gave a talk titled “How (Not) Like a Book: Publishing born-digital scholarship with a university press," a talk that I had started to develop in 2015 as a panelist for the colloquium Does Digital Humanities Scholarship Count? at Stanford's Humanities + Design Lab. The Emory Digital Publishing Roundtable was convened by Michael Elliot—Winship Distinguished Research Professor in English and American Studies, and the university's Senior Associate Dean of Faculty. Michael and his group have gone a long way in articulating the scope and challenges of digital publishing, some of which is available in this report. 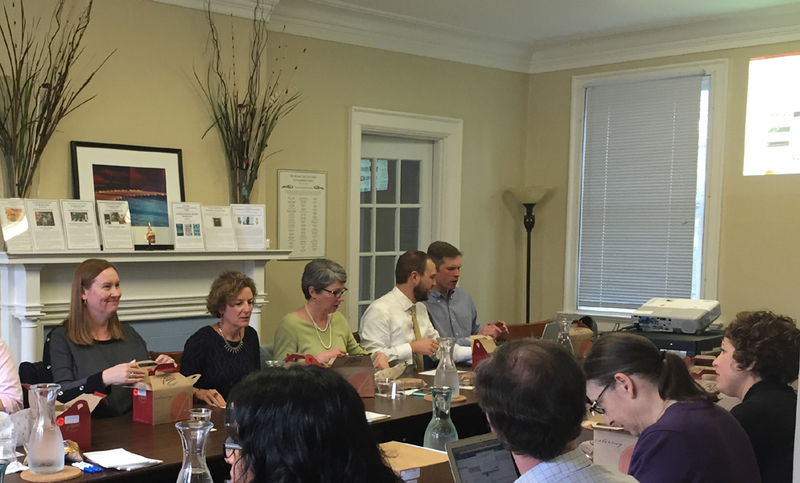 Here is a snapshot picturing the Roundtable group that gathered at Emory's Fox Center for Humanistic Inquiry. 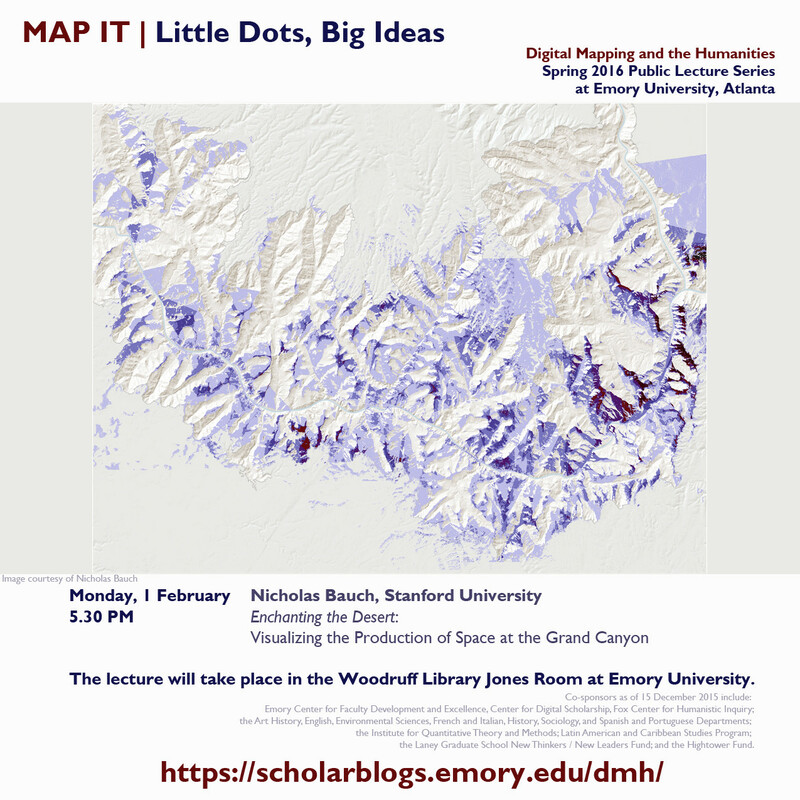 The final event at Emory was to guest-lead Professor Gagliardi's graduate-level workshop, something I called Landscape Photographs and Maps in Conversation: Building viewshed maps. Thanks to an energetic and insightful group of students who, among other topics, helped grapple with the question "why have pictorial and plan views evolved as such different visual epistemologies through modernity?" 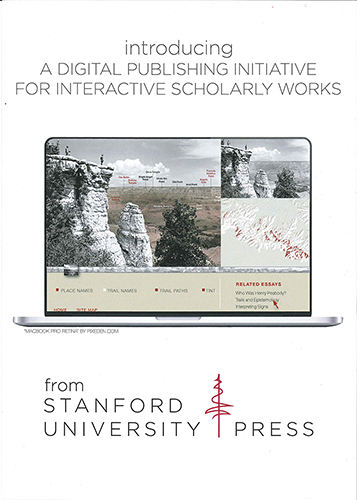 I represented the SUP digital publishing initiative at the MLA conference, an initiative they call Interactive Scholarly Works. 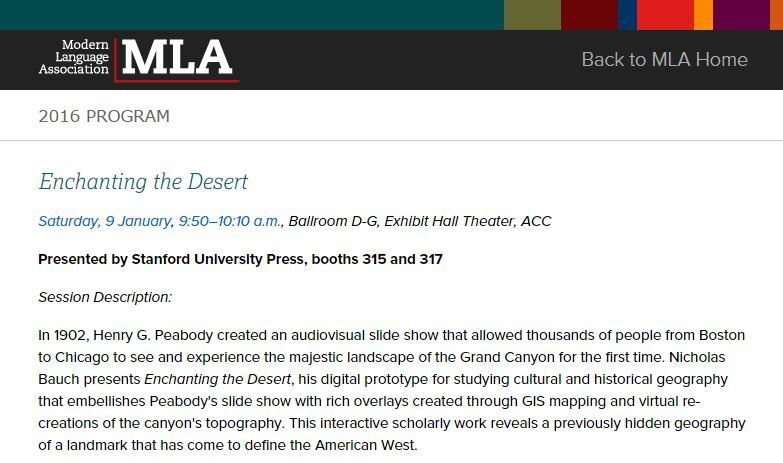 It was wonderful to formally announce this program and its pilot project, Enchanting the Desert, to the MLA crowd in Austin, Texas. It was a great turnout and the crowd had lots of thoughtful questions, one of which was about the propensity for digital scholarship to be accepted by academic "gatekeepers." My answer was that SUP is certainly a gatekeeper, and they're publishing born-digital scholarship. Here is the conference program. 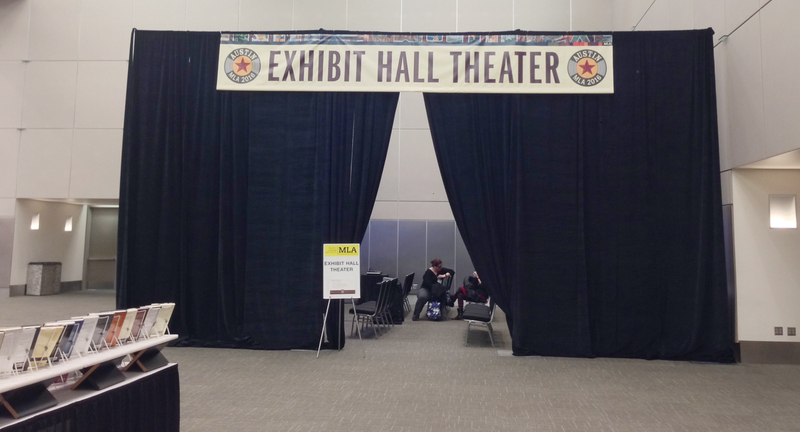 The Exhibit Hall Theater in the Austin Convention Center was for presentations at the MLA conference put on by various publishers. I could not help but feel as if I was truly re-enacting Peabody's turn-of-the-century lantern slideshow when I stepped into this curtained booth to give my talk. BayGeo is a non-profit association for users of geospatial technology, people new to mapping, and GIS professionals in northern California. 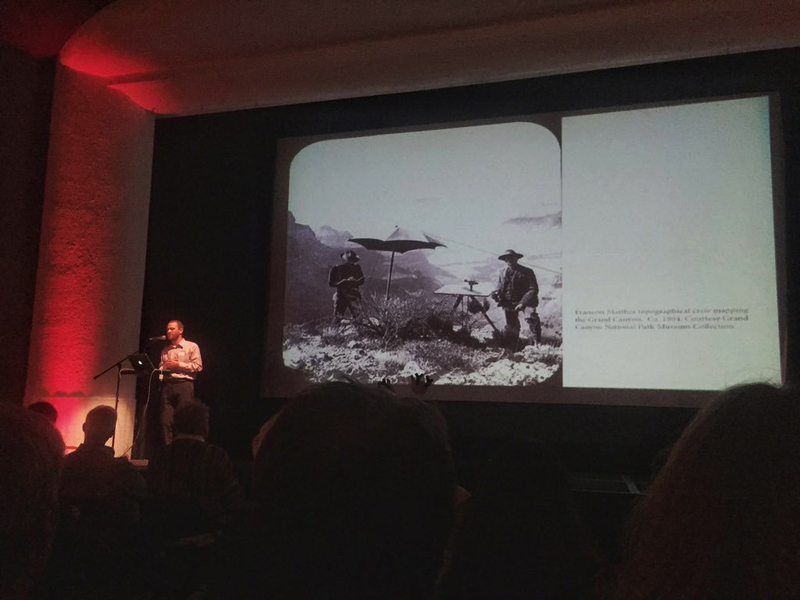 I presented one of the 80 essays that I wrote for Enchanting the Desert as part of their Holiday Mixer, held at the Gray Area Theater in San Francisco. The topic of my talk was the making of the first detailed topographic maps of the Grand Canyon. What an enthusiastic crowd. Thank you for inviting me, BayGeo! Here are a couple pics from the night, and there are lots more here. 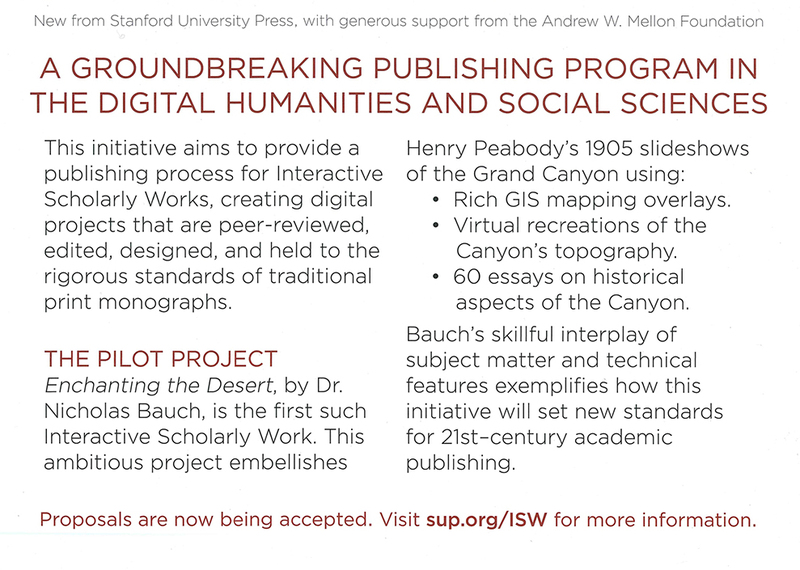 The Stanford University Press marketing team produced these flyers for distribution at places like conferences. One of the many benefits of working with an academic press for born-digital scholarship. Below are the front and back sides.Thank you, SUP! I had the opportunity to spend three days visiting Bard College to deliver their Biennial Mellon Foundation Experimental Humanities lecture and workshop. The Bard College Media Corps put together this summary of my lecture. They also made this fantastic Storify record of the Tweets related to the talk. Thanks to them! Leading a faculty Experimental Humanities workshop called "From the Pictorial to the Plan: Building Geographies for Landscape Photographs." 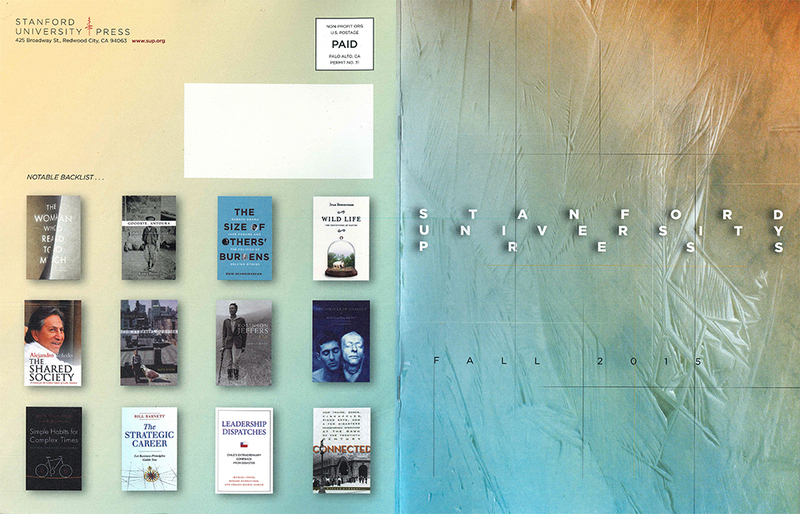 Enchanting the Desert appeared in the September 24 issue of the NY Review of Books as a large, half-page advertisement from Stanford University Press. 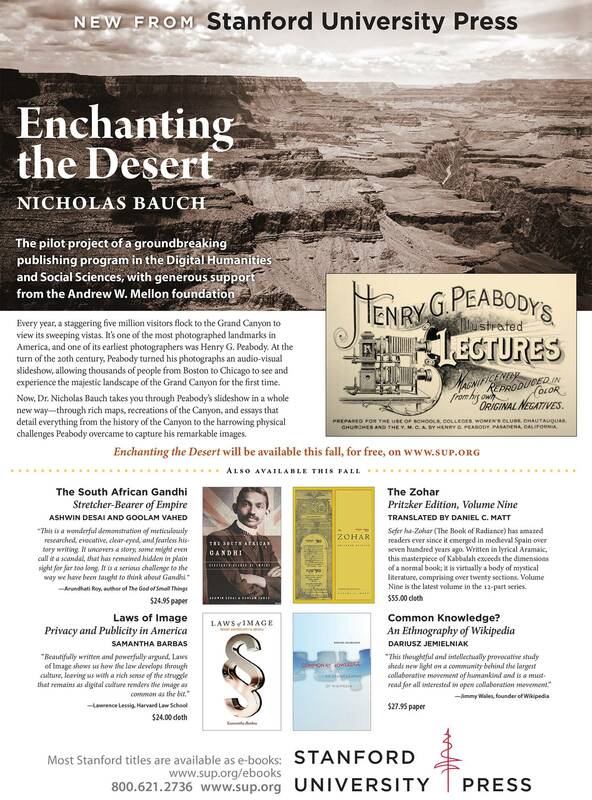 Enchanting the Desert was featured in a full spread advertisement in SUP's Fall Books Catalog. Here is the catalog cover and inside spread. Thank you, SUP! 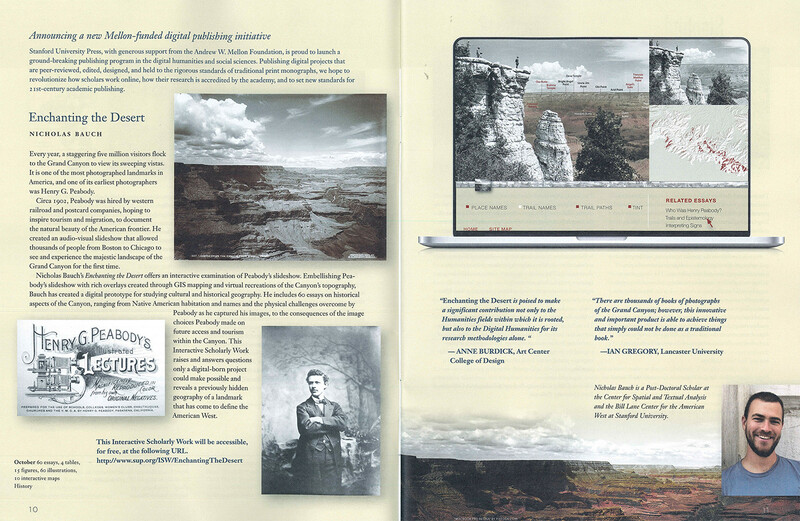 Enchanting the Desert is one of the features in a Publishers Weekly article about frontiers in digital publishing.